PetFinder.my 2nd Anniversary 100-Day Rehoming Campaign - April 17th to July 25th! Yes, PetFinder.my's 2nd birthday falls on April 18th, 2010! In conjunction with our 2nd anniversary, we will be co-organizing a series of Pet Adoption Events in the Klang Valley with Petster Magazine from April to June, and would be inviting various NGOs to participate. These events would be held each weekend (Sat & Sun) at various shopping malls, with 3 days in June at Mid Valley's Pet World Malaysia exhibition as well. In an unprecedented move, over half a dozen NGOs will unite to provide adopters with a true ONE-STOP SOLUTION in adopting animals. During the event, NGOs would cooperate with a set of standardized fees, adoption rules and guidelines. Best of all, each adopter would receive a FREE Starter Pack with all the essential pet products and informative guidelines to get started with taking care of his new furry friend - no more worries on what to do after adopting a pet! Want to help increase awareness of pet welfare and adoption? This is an excellent opportunity for us to lend a helping hand to the homeless animals! During this series of events, we'd require Volunteers to assist us in various crucial outreach tasks such as distributing materials, collecting donations, managing the pets, and promoting pet adoption to visitors. To protect your privacy, please do not post your contact info directly within the reply post here, and only PM me those info. I will update this page with the list of volunteers. Thank you for all your generous assistance. Please keep a lookout on this thread for the latest event information. Help Save Lives By Telling Your Friends! Every person counts. More visitors = More adopters = More lives saved. Help us promote the event and save these animals now! Please click here to download our Event Flyer, print it out and paste it at at your college, apartment or office notice board! We managed to get 9 adoptions, including a 3-legged puppy! SPCA Selangor and Rescue 2 Rehome participated this week at Tropicana City Mall, and each had a fair share of adoptions. A big thank you to our volunteers: Mun, Nigel, Carmen, Linda, Hiba, Alvin, Fei Wern, Marcus, Gary, Chooi Pheng, Soh Bee, and friends that paid us a visit: Alice, Najwa, Charlene, Vivien, Mira and more! The traffic at South City Plaza was not very good, but we still managed to find homes for 2 cats and 1 puppy from Alice of Save A Stray. Rescue 2 Rehome also brought some lovely adult animals for adoption showcase. Thank you to Stella & friend and Siew Leng for helping us throughout the event! We were back at Tropicana City Mall with SPCA and Malaysian Dogs Deserve Better. The crowd was pretty good but there were only 5 adoptions this time. Regardless, our aim of increasing awareness of pet adoptions is being achieved. Thank you to Hiba, Alvin, Christine, Stella, Alicia, Karen, Pei Qi and other volunteers for their great assistance! We had the best adoption week to date, with 14 adoptions from the pets of PAWS and Paws Mission during this Mother's Day weekend! A big thanks to Vien Heng and Siew Leng for helping us out. Another successful weekend, with 14 lovely adoptions - 8 dogs and 6 cats from Save A Stray and Independent Pet Rescuers! Thank you to Stella and Nelson for volunteering. It was a slow weekend with most people back at hometown, but we still managed to get 10 adoptions - 6 cats and 4 dogs from PAWS and Save A Stray! Thank you to Siew Leng for volunteering and helping fetch the animals to and fro. 14 adoptions once again! 10 dogs and 4 cats from Malaysian Dogs Deserve Better and Paws Mission! A big salute to Ai Ney, Wan and Siew Leng for helping us out over the weekend. Our standard spot at Tropicana City Mall was in use, so we had to shift to a more secluded corner and this likely affected our traffic and adoption rates. Nevertheless, we had 5 adoptions from SPCA and Independent Pet Rescuers. We'll be taking a week of rest before proceeding to the Pet World Malaysia event. Our final week of adoption drive took place at Mid Valley Megamall's Pet World Malaysia, achieving an awesome adoption figure of 46 within those 3 days! Thank you to the following volunteers: Alvin, Briana, Bryan & sis, Dennis, Hiba, Illiyana, Khairul, Mun Hon, Nicholas, Oliver, Ryan, Siew Leng, Stella, Su Yin, Sylvia, Wan and Yuri. 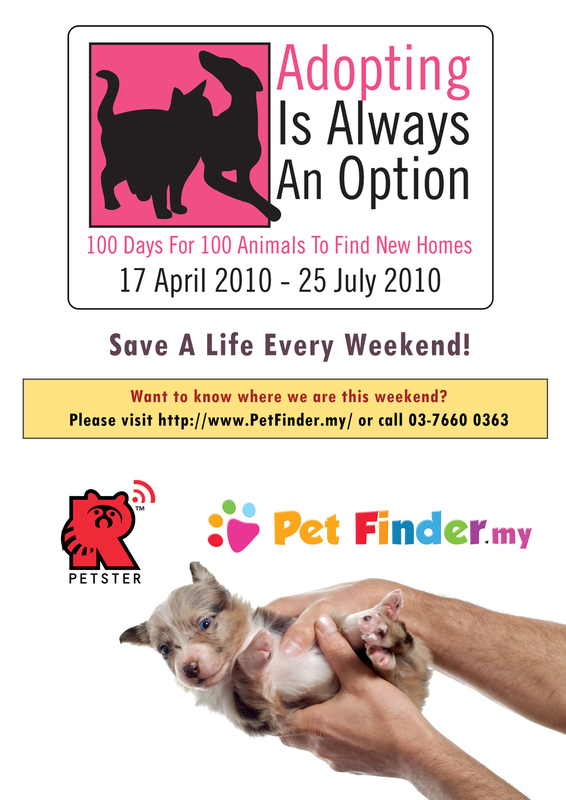 PetFinder.my and Petster Magazine's 100-Day Adoption Drive has reached a successful closure on June 27th 2010. We have achieved 126 adoptions in total which exceeded our 100-adoption goal by 30%, and even hit the target 30% ahead of time - 2 months instead of 3! Once again, we would like to express our deepest gratitude to the animal shelters PAWS, SPCA Selangor, Save A Stray, Independent Pet Rescuers, Paws Mission and Malaysian Dogs Deserve Better, our volunteers and of course the kind-hearted adopters that have helped made this event a success. May all these adopted animals live a happy life forever after, and may more people become aware of pet adoptions so more lives can be saved! Last edited by AndyKoh; 06-29-2010 at 02:06 AM. Hey Mr.Andy. I'm living in subang and would like to commit most of the saturdays helping out with this event. I do possess transport but it is shared. feel free emailing me the details I need to know or i should do to. Thanks for your generous volunteering, Nigelpak! Can you please PM me all your contact information as well? I'll certainly update you once further details are available. Is there any updates on this event? This weekend will be the first week right? any specific iternary/venue for this weekend? khairul here. i think i'm gonna and wanna help u. but i am only able to help after 2nd may. coz my final exam is approaching and my last paper is on 2nd may. I'm still awaiting Petster Magazine to finalize the location and details, but tentatively it should begin sometime mid April, at Ikano, if all goes well. No problem Khairul, thanks again for your lifetime volunteering haha... all the best in your exams, and see you again in May! I'll get you more details once details are finalized. i pm-ed you my details and stuff. Im free during most weekends and on 25th June. :) Would love to help out! Hi Venny, thanks for your details, will keep you updated! Woof Woof ! Meow Meow ! Yes long waited for this, I will be there for most day Andy, will reply you on e-mail for the things we have discussed. i wanna join this event..
but i dunno which date i can go..
but i seriously wanna join!! can u give a brief about this event..
LOTS OF LOVE for cats & dogs! if there are any changes will update you. Yeah, That would be great to see some had interested joining Volunteers. Good to hear from you guys! Thanks again for your consistent help.. I'll certainly get in touch with you once the plans are finalized. Thanks for your help, can't wait to get started with our first major event in 2010! No worries, I'll send you more info once the event is finalized. You can then let me know which dates you would be able to volunteer. Too bad you're so far away.. wish you could come and join us for some events! You're one of our earliest members, and the only one we've never had the chance to meet after 2 years hehe. Nice to hear that your friends are also interested in helping out! The event dates are more or less confirmed, just waiting to hear back from Ikano on final approval of the location. I'll let you know once the plans and details are finalized. We haven't fixed the time yet, but generally it should be from something like 10am - 6pm. Yeah, 2 year, such long time already!. Petfinder rescue mission still carry on, I glad have some Volunteers supporting. Remember us for we too have lived, loved and laughed.